Years ago Elsa Martz longed to find a way to restore the ebb and flow of the New Meadows River as it failed to circulate around Dingley Island, Maine. With the eyes and sensibility of a life-long naturalist, she studied the situation from her handcrafted home in Harpswell, noting how the sediment build-up around the causeway linking the town to the island had smothered the surrounding mudflats for several hundred feet. Aerial photographs only confirmed what she already knew: that this causeway barrier was a big mistake. It just didnt make any sense. Imbued with the convictiongrounded firmly in her Quaker heritagethat one person can make a difference, Martz was not one to sit on the fence harping about what should be done. With encouragement from a local wharf builder who estimated that replacing the causeway with a wooden bridge would cost a mere $40,000, Martz stepped into full throttle and became an unflagging proponent of the Dingley Island tidal flow restoration project. Over the next seven years, underscored by a series of high hopes, setbacks and successes, her campaign grew to involve dozens of individuals, local, state and federal agencies and private corporations. Though the initial estimate proved to be well below the mark, Martz and other restoration supporters kept chipping away. Last summer, a section of the barrier between the island and Harpswell was removed, one side at a time to keep the road open. Working with a private engineering firm, U.S. Navy Seabees then constructed a small, but wide-opened bridge, re-establishing water flow. By July, kayakers and other boaters sailed under the new passageway for the first time in more than 50 years. While it will take time to realize the full impact of the restoration, so far a study by students at Bowdoin College and anecdotal reports indicate that the water quality has improved and the clam-flats have expanded. Martz, who has been the office manager of the physics department at Bowdoin for 15 years, credits her long association with the scientists for giving her the inspiration to see the project through. All day long physicists look for solutions to problems and that has really rubbed off on me, she says. 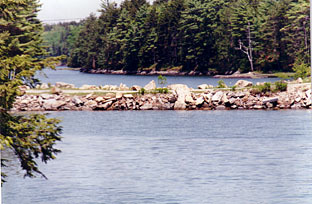 The gradual blockage of the Dingley Island/Harpswell passageway began in the late 1800s when a local man dredged an ice pond on the island and established an ice business. To get the ice wagons across the mudflats his son built a fieldstone causeway with a 12-foot bridge opening. 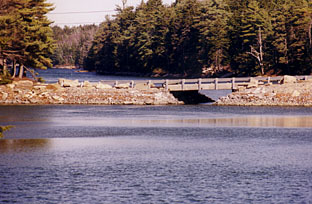 The bridge was later filled in, followed by the reconstruction in 1946 of a causeway without an opening. Thus began the slow but sure build up of silt. 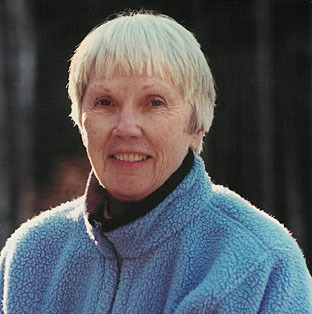 A native of Massachusetts, Martz moved to Maine in the mid-1980s, bringing with her a large format view camera and a deep love of the Maine woods and waters. She eventually designed and helped build her passive solar home that she heats with a Finnish soapstone fireplace. The house rests in a clearing in the woods where these days she can view returning raptors as they spiral above the natural tidal movements of the New Meadows River. Later, a town official objected, saying a wooden bridge would be too costly to maintain. Even so, Martz had already begun piecing together an impressive and supportive network of contacts from the states transportation, planning and environment agencies. To begin the task of raising funds for the project, she found a very generous surveyor to conduct a bedrock analysis. A New Hampshire company supplied information on bridge options, and eventually we had a plan and estimate for a 24-foot [concrete-cast] bridge. But still, no funding. Four years into the project, she spotted a notice in the local paper from Coastal America announcing a program, to remedy harmful environmental situations involving wetlands. She contacted the office, which agreed on the merits of the Dingley Island restoration project and set up a foundation to hold donations and matching funds. Coastal America also acted as the liaison with the U.S. militarys Innovative Readiness Program that supplies labor and other expertise to restore wetlands and aquatic habitats. In the case of Dingley Island, Navy reservists called Seabees were called in to construct the bridge. In 2001 Martz applied to the National Oceanic and Atmospheric Administrations Community-based Habitat Restoration Program and eventually received $75,000. Matching funds came from the Gulf of Maine Council, private donations and the Maine Corporate Wetlands Restoration Partnership. (Local partners included the Town of Harpswell, Bowdoin College students and faculty, Dingley Island residents and the New Meadows River Watershed Project.) In all, project supporters raised around $210,000 in grants and in-kind donations. As for the future, Martz plans to volunteer for local environmental projects, as a writer, copy editor or photographer. With the donation money remaining for the project, she plans to hire a marine biologist to conduct a follow-up study on the restored area within five years. Not long ago, she approached a man digging for clams along the mudflats between Harpswell and Dingley Island. Hows it going? Martz asked. You know, the man replied, there are air holes appearing closer to the bridge. For Martz it was a sigh of relief and a reaffirmation.